In 2008, Professor John Hattie took the educational world by storm with his book on Visible Learning. Two years later, he was sitting with a colleague, Deb Masters, discussing how to turn his research into the Visible Learning plus programme. We talk to Deb to find out more. This month is the first anniversary of an exclusive UK partnership with Osiris Educational, a partnership that already has great evidence of the positive impact Visible Learning is having on schools in this country. Deb now works exclusively on Visible Learning plus and is a well-known face at the Lincolnshire headquarters of Osiris, in Raithby. “To be successful, we need to have great partners such as Osiris,” said Deb. “They are vital to our success and we choose them with great care. Not only do we need to know they can deliver the school interventions that are needed, but we also need to be confident they share our vision and our dream. “It is also not just about finding the right companies to work with: we also have to look at whether the country’s educational system is at the right place in its evolution,” she added. “We have had interest from countries not yet in the right place. Unfortunately, if I were to go and talk to them about Visible Learning, they would wonder just what planet I had come from. “However, we have launched in the USA and in Scandinavia and talks are on going in the Netherlands. We also have huge interest in Germany and China, but the correct conditions have to be in place. “We need countries such as the UK, whose schools are self-managing, where they have the power to make whole-school decisions. In our Foundation Days last year, it was obvious the mix was right. 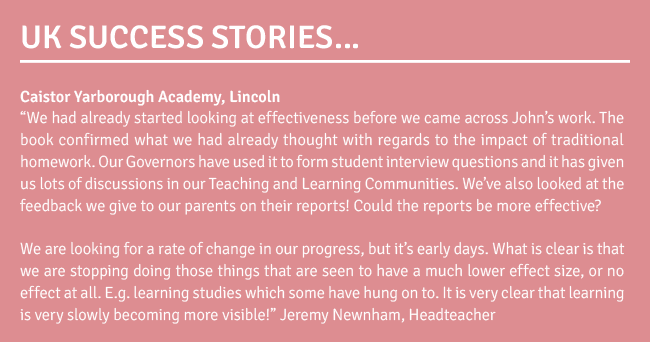 “You are already doing data analysis, which is a huge part of looking at evidence of progress, and you already have a focus on Assessment for Learning (AfL) and you also prepare for Ofsted with Self-Evaluation Forms (SEFs),” said Deb. “Teachers here last year were asking all the right questions, all the way through, and most understood that the Foundation Day is just what it says: an introduction, an awareness day, if you like. “When John and I sat down to talk about his research, he wanted it to be so much more than a one-off keynote speech. He had already discovered that, although useful as an introduction to the concept, schools needed far more if they were to embed the principles. With Osiris, we can now deliver just what is needed through our Foundation Days,” said Deb. This exciting new intervention is an in-depth model of school change. It is based on a professional development programme that explores how evidence can be used to create innovation in the learning environment. Teachers know that the art of teaching requires constant interventions to ensure there is cognitive change in a pupil. The same applies to a whole school. This intervention transforms an organisation and accelerates the process of individual and whole-school change. It builds significantly the capacity of learners to learn, teachers to teach, leaders to lead and systems to improve. The intervention is appropriate for everyone within a school: from the newly qualified right through to senior leaders. To work effectively, it must be done teacher by teacher and not as a top-down, one-size-fits-all model. Deb Masters has a background in primary and secondary teaching and has worked extensively with John Hattie. In partnership with John Hattie, Debra has established the in-depth school change model of professional learning and development which will be delivered in many countries around the world. Want to lift your school up to its ultimate level?